Elegant pearl and rhinestone hair pin set for your or your bridesmaids on your wedding day. Enjoy a mixture of iridescent Tahitian look Swarovski crystal pearl beads as well as genuine Czech clear crystal "fireball" beads in your choice of gold or silver tone setting and wire wrapping. 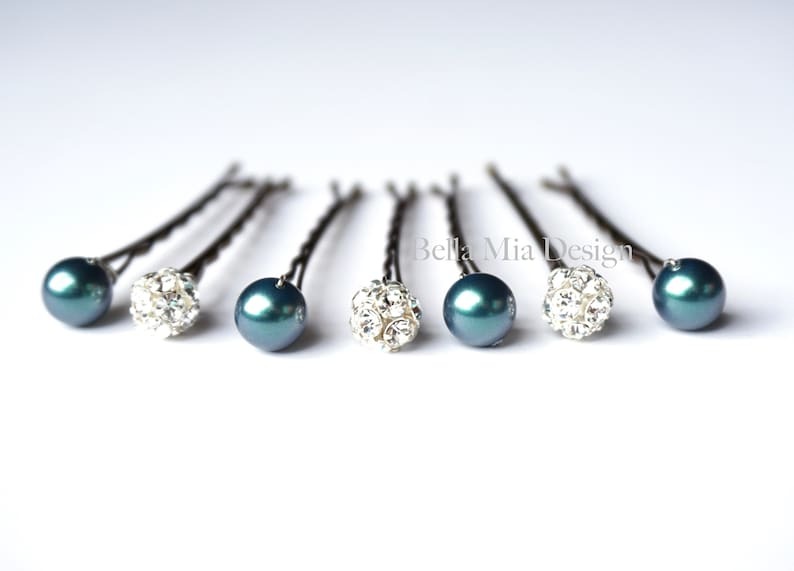 This group of (7) 8mm beads are each attached to a gripping 2 inch bobby pin. Wire wrapped to secure the beads and add textural interest. Tahitian is deep muted greenish blue. It is almost a dark teal color, but perhaps a bit more green than the photos depict as it was difficult to capture. I am really loving this new color by Swarovski! It is supposed to resemble true Tahitian pearls, but is a crystal version of them. These lovely pins are designed to tuck into an updo hairstyle or or next to a braid on your wedding day, or for any other special occasion. 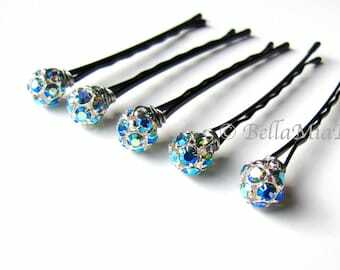 (3) - 8mm Czech clear crystal bead hair pins. Select silver or gold tone setting during checkout. When adding to your cart, you can also choose your Bobby Pin color.